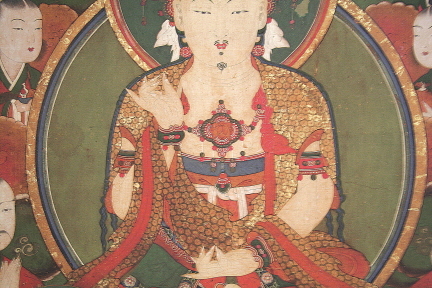 삼장보살도는 죽은 이들의 영혼을 천도하기 위한 의식용 불화로 천장보살(天藏菩薩), 지지보살(持地菩薩), 지장보살(地藏菩薩)로 구성되는데, 고려시대의 사례로 알려진 것이 없고 조선시대에만 보이는 도상이다. 삼장보살도의 화폭 구성은 한 폭에 세 존상을 모두 표현한 경우, 두 폭에 걸쳐 표현한 경우, 세 폭으로 나누어 그린 경우가 있다. 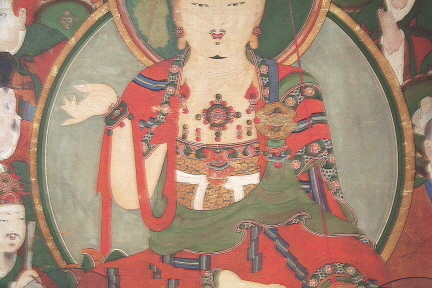 동화사 삼장보살도는 가로로 긴 한 화면에 세 보살과 그 권속들을 모두 표현한 경우이다. 화기를 통해 대시주가 18세기 초 대표적인 화승 중 하나인 의균(義均)이며, 당시 동화사 불화 외에 타 지역의 경주 거동사 내원암(巨洞寺 內院庵)의 삼단탱(三壇幀), 신녕 수도사 감로왕도(新寧 修道寺 甘露王圖), 운문사 청련암 명부도(雲門寺 靑蓮庵 冥府圖, 지장시왕도로 추정), 창녕 용흥사 아미타설법도(昌寧 龍興寺 阿彌陀說法圖), 영지사 향로전 관음보살도(靈芝寺 香爐殿 觀音菩薩圖) 등도 함께 제작되었음을 알 수 있다. 이를 통해 당시 동화사가 팔공산 인근 지역에서 주로 활동하던 화사들의 주 근거지, 혹은 작업 공간으로 활용되기도 하였음을 짐작할 수 있다. 16세기 이전으로 올라가는 삼장보살도들은 대부분 해외에 유존하고 있고, 그나마 17.18세기 초에 제작된 석탑사 삼장보살도(1699)나 대구 파계사 삼장보살도(1707) 조차 그 소재가 불분명한 상황에서 이 삼장보살도가 갖는 불교회화사적 의의는 크다고 하겠다. 더불어 안정된 구도와 비례, 인물의 세부묘사, 채도가 높은 적·녹색의 안정감 있는 대비와 조화, 세밀한 필선과 정교한 문양 등 전반적으로 높은 완성도를 보인다. 화풍 상 17세기 후반에서 18세기 초까지 팔공산을 중심으로 크게 활약한 화승 의균의 화풍도 뚜렷하여 화파(畵派) 연구에도 중요한 작품이다. 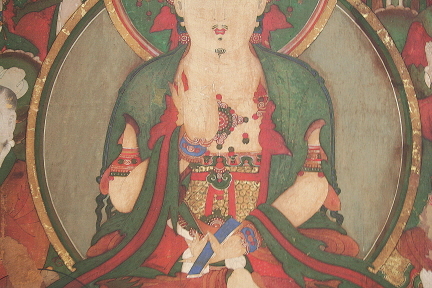 This Buddhist painting was made to occupy, along with a painting of Tripitaka Bodhisattvas, the middle tier of the three-tier painting enshrined in Daeungjeon Hall of Donghwasa Temple in 1728. 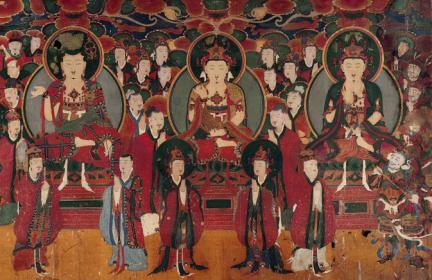 A throng of Buddhist deities and their attendants is depicted in the painting, including Ksitigarbha, the ruler of the Buddhist underworld, with his two attendants, Domyeong Jonja and Mudok Gwiwang, the Ten Underworld Kings, Judges, Underworld Emissaries, Errand Boys, Flame-Hair Jailers, Generals, and six bodhisattvas arranged in strict symmetry. 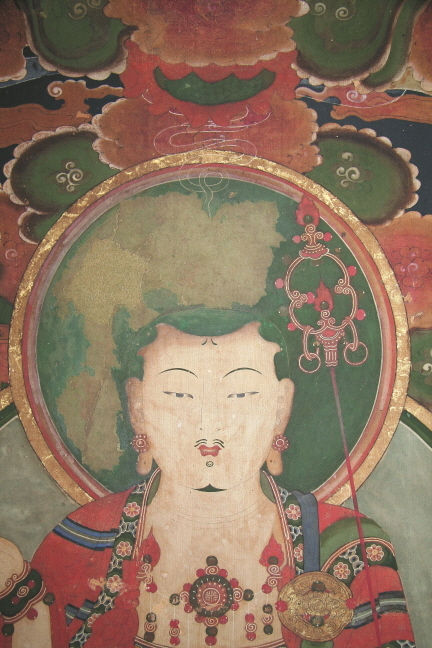 Ksitigarbha, the principal figure of the painting, is located at the center wearing the “sun-moon” crown. 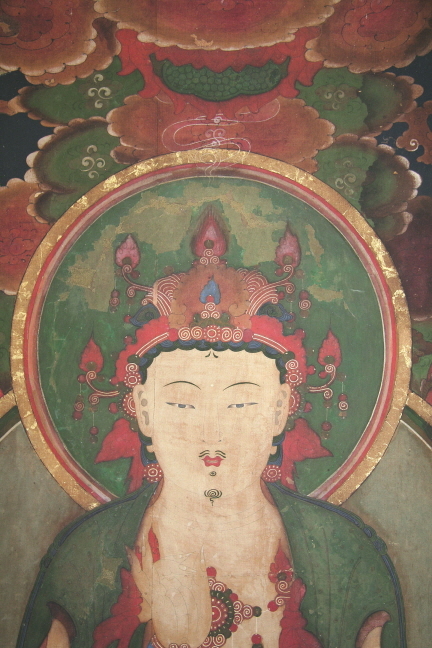 He is flanked, as in ordinary paintings of the Buddhist Underworld, by the odd-number kings led by Domyeong Jonja on the left and the even-number kings led by Mudok Gwiwang on the right. 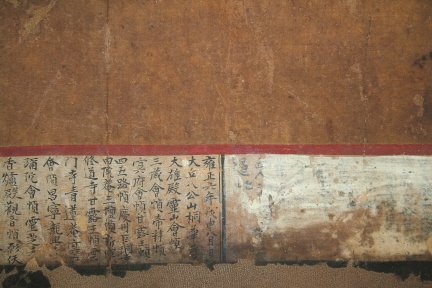 There is a clear record of this painting’s production date and a list of the painters who participated in its production. 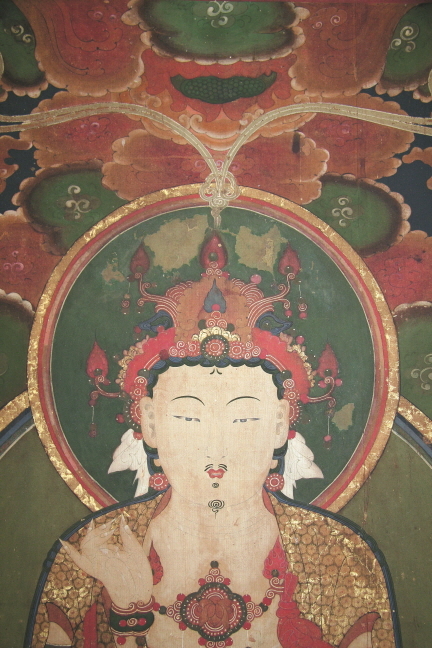 It also provides important clues about various aspects of Ksitigarbha paintings of the early 18th century and the artistic styles employed by painters in the inner area of Gyeongsangbuk-do.